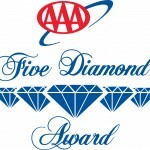 In the second half of 2012, AAA started implementing changes in how they score hotels who are candidates for 5 diamond status. This was the first time they have made a change to their program since the year 2007. The new AAA Hotel Rating Guidelines can be found here. Click on the link halfway through the article to download the PDF. If you skip to page 30 on the PDF file, you will see the new AAA Hospitality Standards for Five Diamond Hotels. It appears to be much harder to pass. The old program had 391 possible points, the new program has only 345 possible points. However, it appears the minimum needed to pass is still 268 points. You used to need only 68.5 percent to pass, now you will need to score 77.7 percent. Many of the points that were removed were the easiest points. You no longer get points for having 24 hour reservations, accurate pre-programed phones, or the ability to post miscellaneous charges to the guest room. I would estimate that most hotels will lose about 15 to 20 points from their previous score because these standards were removed. The new scoring is a bit more subjective than the old scoring system. Instead of ‘attendant addresses guest by name during closing’, the new standard is ‘attendant uses guest’s name as appropriate for the manner of the guest.’ Other standards include ‘attendant provides an appropriate introduction’ and ‘attendant extends an appropriate closing’. The last question in each section ‘Hospitality, Refinement, and/or Competency’ now can be scored anywhere from 3 points to minus 3 points. If any employee provides poor service or gives incorrect information, you can now lose 6 points pretty easily. A few of the very hard to achieve standards have been eliminated. For instance, room service no longer has the standard ‘there is additional evidence of personalized services’. If you need help preparing for your audit, contact us. The TrueGuest Service Experience Audit is the measurement and feedback tool you need to help you succeed. Hotel Management: Strong occupancy and higher ADR lead to lower guest satisfaction? This entry was posted in Guest Service, News & Notes and tagged AAA, AAA Hotel Diamond Status by TrueGuest. Bookmark the permalink. Headquartered in Los Angeles, TrueGuest was created by former hotel executives to serve the hospitality industry by measuring and improving guest service and internal controls. Our Service Experience Audits are used by top brands such as Ritz-Carlton, St. Regis, Marriott, Renaissance, Hilton, Hyatt, W Hotels, Intercontinental, Sheraton, Radisson, Holiday Inn, Wyndham, and many more. TrueGuest LLC | 27201 Tourney Road, Suite #201 | Valencia, CA 91355 | (818) 301-5655 | Copyright 2016. All Rights Reserved.